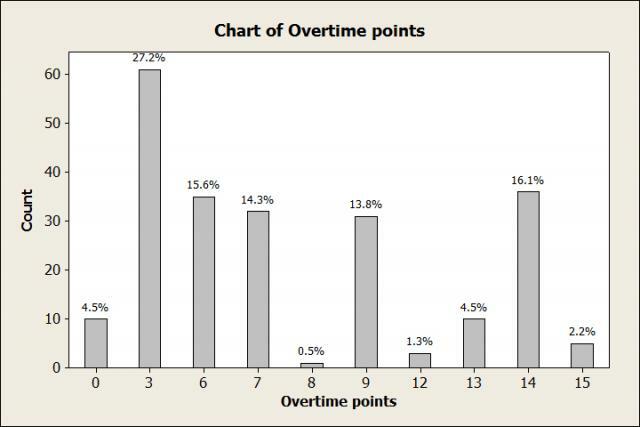 Last week I took a look at some different aspects of overtime in college football. I found that most games only last one overtime period, home field advantage still exists, and that the team that gets the ball 2nd has an advantage. Now I want to continue the data analysis and ask some more questions. Specifically, how many points do teams combine for in overtime, and does the team that ties the game in regulation carry that momentum to overtime? You can follow along by getting the data here. How many points are scored in an overtime period? The first thing I did was make a bar chart of all the different scoring combinations in overtime periods the last 5 years. Three points is the most likely outcome, occurring 27.2% of the time. This is because if the first team doesn’t score, the second team only needs a field goal to win. If a game needs another overtime, it’s most likely because both teams scored a touchdown (16.1% of the time). And we see that neither team scoring is very rare, happening only 4.5% of the time. Penn State and Michigan actually had two scoreless overtimes. So according to these statistics, what were the odds? In this case, we have a binomial distribution (there were only 2 outcomes, neither team scored, or at least one team scored) with 4 trials (since there were 4 overtimes) and an event probability of 0.045 (the odds of neither team scoring). What we want to know is the probability that 2 out of 4 of those overtimes would be scoreless. So given the fact that there were 4 overtimes (which, as we saw in part 1, is rare to begin with), there was only a 1.1% chance that 2 of those overtimes were scoreless. But an even more interesting question is, what were Michigan’s chances of winning in the 2 overtimes where Penn State got the ball first and failed to score? There were 67 cases where the team that started the ball did not score. In 57 of those cases (85%), the team that had the ball 2nd went on to win in that overtime. And of those 57 winning teams, 42 of them (74%) won by kicking a field goal, as opposed to scoring a touchdown. So after Penn State missed a field goal in the 1st overtime, and fumbled in the 3rd overtime, Michigan had about an 85% chance of winning in each overtime. But they didn’t, and Brady Hoke was crushed for playing conservative both times. However, the numbers show most coaches do the exact same thing and it works out for them a majority of the time. Perhaps you could criticize the play calling in those 2 overtimes (not a single rush attempt for Devin Gardner other than centering the ball? ), but playing for a field goal does work most of the time. On the flip side, the odds that Penn State failed to score in two different overtimes and forced another overtime in both were a slim 0.152 = 2.25%. Nittany Lion fans can consider themselves very lucky. When it comes to sports commentators, momentum has to be one of their favorite words! From quarter to quarter, drive to drive, or even play to play, announcers are always saying teams are "trying to gain momentum" or keep the other team from getting any. Surely if momentum were real, we would see its effect in college overtime games. The team that scores to tie the game in regulation would have all the momentum, right? Therefore, they should be more likely to win in overtime! For each game, I recorded whether the team that tied the game in regulation won or lost. Let’s see if the team that scores last in regulation wins more than 50% of the time. 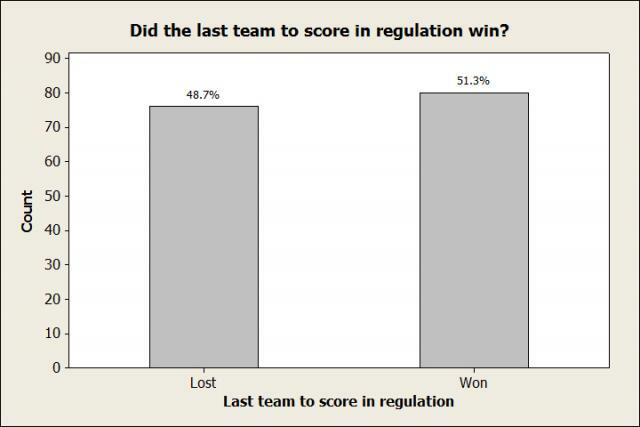 The team that scored last in regulation did win more often, but only by a very slim margin. It doesn’t take a Six Sigma black belt to tell you that the proportion of teams that won is not significantly greater than 50%. But our quest to find momentum is not lost. The data above does not account for when the team tied the game. Consider the 2008 game between West Virginia and Colorado. West Virginia tied the game with 4:49 left in the 3rd quarter! Nobody scored again until Colorado kicked the game-winning field goal in overtime. Surely any momentum West Virginia gained when they tied the game was gone when overtime started. So to account for this, I also recorded how many seconds were left when the final score of regulation occurred. Just to let you know, the median value was 54 seconds. So in the 156 overtime games since 2008, over half of them were tied with less than a minute to go in the game. But to get a larger sample size, I first want to look at teams that tied the game with less than two minutes to go. They had to have gained some momentum for overtime, so let’s see if they won more often! This table shows us that when a team scored with less than 2 minutes left in the game, they only went on to win 49% of the time. In fact, they were more likely to win if they tied the game with more than 2 minutes to go! That doesn’t say much for momentum. But I’m not giving up. Maybe the game-tying score has to be really dramatic. Like, less-than-30-seconds-left dramatic. Just when the other team thinks they’re about to win, you completely deflate them and force them to play more football. With them shaking their heads at how close they were to winning, and you fired up that you’re still alive, surely that momentum will carry over to overtime! Wait, what? Teams that scored in the last 30 seconds went on to win only 41% of the time! It turns out that it doesn’t matter how we slice it, there just doesn’t seem to be any momentum when it comes to college football overtime. Penn State drove 80 yards in 23 seconds, capping the drive off with the game tying touchdown with 27 seconds left in the game. Nittany Lion receiver Allen Robinson had an amazing catch on that drive, which became Sportscenter’s #1 highlight of the day. The sold-out homecoming crowd of over 100,000 people roared as loud as any stadium in the country. And Penn State used all that momentum to gain 2 yards in 3 plays and miss a field goal on their first possession in overtime. Momentum? Nope. As Bill Barnwell would say, it looks more like Nomentum. And that’ll wrap things up! So when it comes to college football overtime, remember that if you want to gain an advantage, you’re better off playing at home and starting off on offense 2nd. And if somebody says a team just gained all the momentum by tying the game in the closing seconds, slap them on the head and tell them they're wrong. Wait, on second thought, don't do that—just show them the statistics instead. After all, you can't argue with facts!